If people are building smaller cities, then it's good to get farmers in early and monopolize the farms. You can score a lot of points at the end. 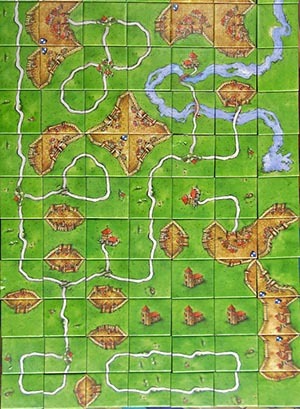 Farms are often the biggest scorer in many games. When you place a piece and you can't do much with it, place it to hinder your opponent. 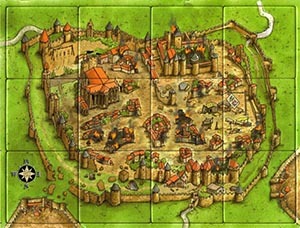 If he is trying to complete a city and you weren't able to figure out a way to share it, then place a tile next to the potential closing piece because it will limit his options. Try to maximize your follower's throughput and don't place them on tiles where you won't see them again until the end of the game. The basic principle is you want each follower to do as much work as possible rather than being stranded on incomplete towns, roads, and monasteries or farming an area that will never be developed. Cities that can get completed easily. Monasteries are great in the beginning but not in the midpoint or endgame. Don't worry about farms too much at the start, but focus on them later in the game when a few cities have taken shape. Always keep one follower for quick "place and score" wins, like 4-point cities and short roads. As with most games, you can only get better with practice. When I first began playing, I was breaking 100 points a game on average. After learning exactly what scored what and being able to predict, I was scoring up to 150 to 180 points a game. How many points will you expect to earn with this move? How much of that will be because your opponents have helped out? How many moves are left in the game? How difficult is it to complete something? In general, it's a solid strategy to build and complete as many large things. Building up your segments fast and effectively and avoid wasting tile placements that don't immediately benefit or protect your segments. But be still careful not to get too ambitious since you will eventually have to complete everything on time. Work on a couple of projects requiring different tiles at the same time (big city and long road). Know the tiles that don't exist or the tiles that are not anymore available. Expand outward because it's easier to place tiles when they are not touching other tiles. If you can focus on cites, do it. The returns can swing the game, even when someone has played a farm heavy game! If the other players are engaged in farm wars, leave them be and focus on cities. No one picking up on farms? Get a few farms. Do whatever the other's aren't doing and try to stay ahead of the pack this way.